In recent days, US and European diplomats have been engaged in a frenzy of activity on the Israeli-Palestinian front, before they settle down for the usual two-week Christmas hibernation. A sense of urgency looms because Washington is supposed to unveil next month its so-called “framework proposal” for the creation of a Palestinian state, in a last desperate effort to break the logjam in negotiations. For this reason, the outlines of the US vision of an agreement are finally coming into focus. And, as many expected, the picture looks bleak for the Palestinians. John Kerry, the US secretary of state, who has invested much of his personal standing in a successful outcome, has grown increasingly forthright that an agreement hinges on satisfying Israel’s security concerns, however inflated. During a speech to the Saban Forum in Washington this month, Kerry said President Barack Obama’s highest priority was Israel’s “ability to defend itself, by itself”. Shortly afterwards, Kerry headed back to the region to show Israeli and Palestinian officials what he meant. Mahmoud Abbas, the Palestinian president, was reportedly “boiling mad” by the US proposal. In recent days PA spokesmen have accused Kerry of “appeasement” and of failing to be “a neutral mediator”. The criticism looks more than justified. Under cover of a vision for peace, the US secretary of state is offering an Israeli security plan at the expense of meaningful Palestinian statehood. That is not entirely surprising given that the plan was drafted by John Allen, a general formerly in command of US forces in Afghanistan, who has spent months quietly liaising with Israeli counterparts. The main sticking point is the Jordan Valley, an area that was expected to comprise nearly a quarter of a future Palestinian state. Allen has indulged an Israeli demand that it be allowed to continue a long-term “military presence” in the Jordan Valley, of at least 10 years. Not only this but, according to a memo sent by Abbas to Obama, which the Haaretz newspaper revealed this week, the US plan would condition an eventual Israeli withdrawal on the Palestinians meeting a “test of implementation. Abbas rightfully believes that this would give Israel an effective veto on ever leaving the Jordan Valley. That is a big retreat from Washington’s earlier commitment, made at the Annapolis talks of 2007, that no Israeli soldiers would be stationed in the West Bank following an agreement. 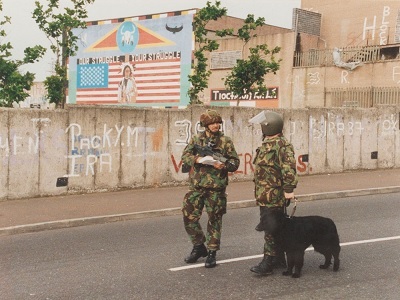 Security guarantees were to be provided instead by Nato troops, under US command. The new proposal should be a deal-breaker. The valley is a vital resource for the Palestinians, one they have been effectively stripped of for decades by Israel’s exaggerated “security needs”. The Jordan Valley offers the only land border in the West Bank that would be potentially under Palestinian control. It is one of the few remaining undeveloped areas, making it a possible site to which hundreds of thousands of Palestinian refugees could return. And its lands are fertile and warm all year round, making it highly productive and a likely engine for the Palestinian economy. According to Allen’s plan, Israel’s security also requires that Palestinian security forces be only lightly armed, that Israel has control over the airspace and all borders, and that the US install spying technology – euphemistically called “early warning systems” – throughout the West Bank. In other words, the US vision of a Palestinian state looks remarkably like the model Israel has already implemented in Gaza. One need only listen to the words of Israel’s prime minister, Benjamin Netanyahu, from a decade ago to understand his role in this new plan. In 2001 Netanyahu spoke to a group of settlers in the West Bank at a meeting that was secretly filmed. There he boasted that during his earlier premiership, in the late 1990s, he had halted the peace plan of that time, the Oslo Accords, through what he termed a “trick”. He foiled a Palestinian state’s creation by agreeing to limited withdrawals from Palestinian land while insisting on the retention of the most significant areas, especially the Jordan Valley, by classifying them as a “specified military site”. Netanyahu told the settlers: “America is something that can be easily moved. Moved to the right direction.” Those words now seem prophetic. 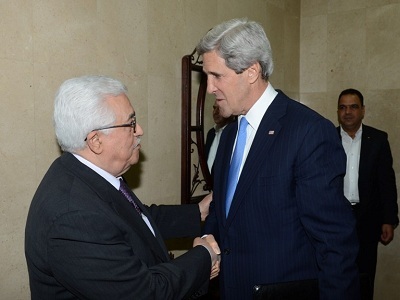 In rejecting the US plan, Abbas appears to have the backing of his people. A poll published this week showed only 19 per cent believed the talks would lead to an agreement. So, given the essential conflict between Israel’s “security” requirements and the Palestinian demand for statehood, how does Kerry intend to proceed? That too is becoming clear. The task of making Israel and the Palestinians play ball is being subcontracted to the European Union. That makes sense because, as the main subsidiser of the occupation, the Europeans have major financial leverage over both parties. Earlier this month the EU brandished its stick. It warned that it would stop financing Abbas’ Palestinian Authority if no agreement had been reached by the end of the talks. Though widely seen as a threat directed towards Abbas, whose political power base depends on EU money paying tens of thousands of PA workers each month, it was equally aimed at Netanyahu. Were the PA to be wound up, the huge costs of running the occupation would again fall to Israel. The 28 European member states have also warned Israel that should it carry on building settlements in the coming months, they will officially blame it for the talks’ failure. On Monday, Europe unsheathed its carrot. It is offering both Israel and the Palestinians a major aid package and an upgrade in economic relations to the EU, conferring on them a status of “special privileged partnership”. This would reportedly bring each side huge trading and security benefits. However vigorous the EU’s arm-twisting, the reality is that the Palestinian leadership is being cajoled into an agreement that would destroy any hopes of a viable Palestinian state. Abbas is said to have viewed the US plan as “worse than bad”. His agreement to it would be worse than disastrous. – Jonathan Cook is a writer and journalist based in Nazareth, Israel. His latest book, released this month, is “Disappearing Palestine: Israel’s Experiments in Human Despair” (Zed Books). He contributed this article to PalestineChronicle.com. Visit his website: www.jkcook.net. and contact him at: mail@jkcook.net.